← Same short Vepr again. This rifle is fractionally shorter than an AR10 with 16″ barrel but has less muzzle flash and delivers 300-400fps higher velocity. At 600 yards, that’s about 3 feet less bullet drop! While in Florida, I shot it sub-MOA with 168gr match ammunition. This entry was posted in rifle, sound suppressor and tagged 308Win, bullpup, keltec, RFB. Bookmark the permalink. How can it be shorter than an AR10 yet have 300-400fps greater velocity? AR10 has conventional layout. This rifle is a bullpup and have 6″ more barrel length with overall length 1/2″ less. 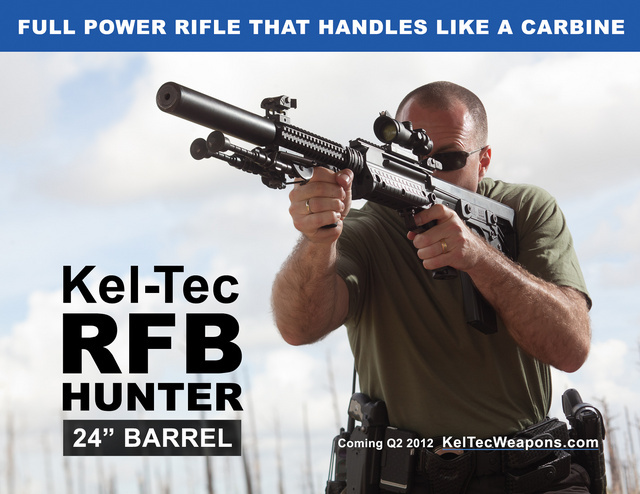 Early RFB lore had Kel-Tec producing a “target” model with a 28 or 30″ barrel, which, in some loadings, with a slower twist, would give velocities not seen in calibers below .300 WIN Mag. Is THAT rifle still going to be produced? Well, as pictured it’s an Arizona legal hunting rifle now, or will be 90 days after the Legislature adjourns Sine Die, since she signed both the suppressors for hunting and no magazine limit for hunting bills. I’ll still never see one, been waiting for what, four years? Five? Can’t even remember now. It will just be released by the end of second quarter of 2012. Hopefully it will be “released” and PRODUCED in volume so we can actually buy them.